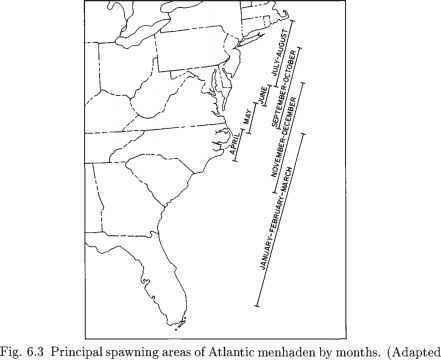 Atlantic menhaden are found from Nova Scotia (Canada) to Florida (USA) (Reintjes, 1969). 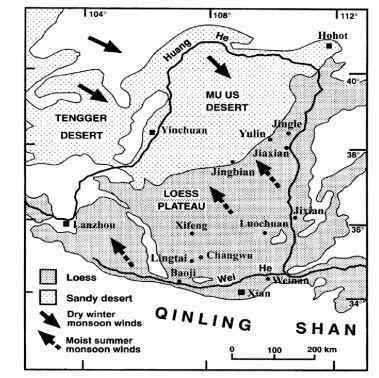 They undergo extensive migration, encountering variable environmental conditions throughout their life cycle. Migration is generally northward in the spring and summer with adults stratifying by age and size (older and larger fish are usually farther north), and southward in the fall and winter (Nicholson, 1978). mortality, although small parts of any brood may be destroyed by adverse environmental conditions (Hoss et al., 1974). Spawning activity during the northward migration is limited, taking place near shore in the bays, sounds, and estuaries along the coast (Higham & Nicholson, 1964). Intensity increases to its maximum during the fall/winter migration from North Carolina southward, and spawning occurs increasingly further offshore, nearer to the edge of the continental shelf (Fig. 6.3). All age groups of migrating fish from the north are represented during the fall/winter spawning migration (Nelson et al., 1977; Nicholson, 1978). Larval menhaden are most abundant along the coast from November to April. Over three-quarters of larvae are collected from between 20 and 75 km offshore. Sample collections north of Cape Hatteras (North Carolina) occur sporadically and are, therefore, less abundant than those from the south of this Cape (Judy k Lewis, 1983). During approximately a two-month oceanic phase, larvae undergo a period of passive drift; movement is the result of ocean currents (Nelson et al., 1977) (Fig. 6.3). Atlantic menhaden larvae are then transported into estuaries by ocean currents, spending several months in the tributary streams almost reaching fresh water. During this time, they metamorphose into juveniles (Henry, 1971). In late summer the juveniles leave the tributaries in schools, returning to the bays, sounds, and estuaries, and by late fall and early winter they migrate to the ocean (Henry, 1971). 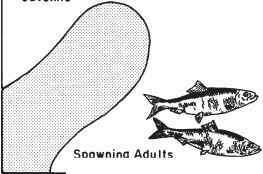 Schooling is a distinct characteristic of menhaden, beginning as early as the late larval/early juvenile stage and continuing through old age (Reintjes, 1969). The menhaden fishery is dependent on these abundant surface schools for exploitation. Most Atlantic menhaden are mature at age two, and all are mature at age three (Lewis et al., 1987). Maximum reported age for menhaden is 10 years (Nicholson, 1975; Reintjes, 1969), and therefore they can potentially spawn for about seven years (Higham & Nicholson, 1964). Menhaden feed primarily by filtering phytoplankton, zooplankton and other small particles in the water column ranging in size from 2 to 200 fxm depending on fish size (Durbin & Durbin, 1975; Friedland et al., 1984; Lewis & Peters, 1984). Algae are also very important to the diet of older menhaden especially in non-marsh environments (Durbin & Durbin, 1975). Feeding studies indicate that juvenile menhaden derive much of their energy from sources other than phytoplankton-based food webs, implicating land-based detritus as an important food and energy source either directly (Lewis & Peters, 1984; Peters & Schaaf, 1981) or by aiding in the retention of other filtered particles (Friedland et al., 1984). Spartina alterniflora, or salt marsh cordgrass, is the major source of detritus in many marsh-dominated estuaries along the Atlantic coast, and therefore may be an important source of energy for menhaden (Lewis & Peters, 1984). The diet of menhaden changes as the fish increase in size (from being mainly herbivorous to omnivorous, and with the relative importance of detritus) and also varies geographically (Friedland et al., 1984; Peters & Schaaf, 1981). Juvenile and adult menhaden are a major constituent in the diet of carnivorous fishes including abundant and recreationally important species such as bluefish (Pomatomus saltatrix), striped bass (Morone saxatilis), summer flounder (Paralichthys dentatus) and weakfish (Cynoscion regalis) (Reintjes, 1969). Primary predators of larval menhaden are copepods. The smaller copepod, Cen-tropages typicus, is able to ingest yolk-sac larvae of menhaden, but not the larger first-feeding larvae. The larger copepod, Anomalo-cera ornata, however, can ingest both larval sizes at approximately equal rates for a given prey concentration (Turner et al., 1985).